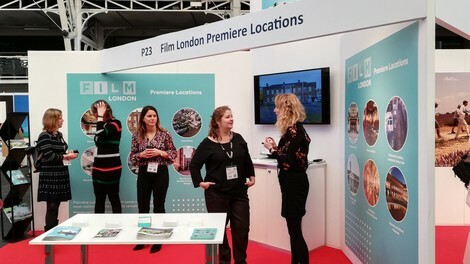 Last week Film London exhibited and presented at FOCUS 2018, a two day trade event showcasing and connecting content makers, production services and locations providers on an international scale. Michelle Jenkins, Head of Production Services at Film London spoke to a panel of location management experts about shooting in the capital and explored how Film London is working to keep London filming. The panel discussed how filming in London has changed over the years, with the introduction of Film London's London Filming Partnership in 2005 helping to bring together local authorities, companies and transport facilities with the aim to make London as film-friendly as possible. The Partnership established vital production guidelines that not only inform crews on aspects such as risk assessments and timings, but also respect the local residents and future productions that use the location. For a more sustainable industry, the panel encouraged the use of local facilities in order for productions to be compact as possible to reduce millage, space and wastage. Film London's Green Screen is an initiative which supports environmentally friendly filming and provides targets and advice on how to do so. On day two of the event, James Waller, Grid Project Lead and Consultant at Film London spoke to Supervising Location Managers Bill Darby and Ali James on the making of summer blockbuster Mumma Mia! Here We Go Again (Darby) and Christmas release Mary Poppins Returns (James). One challenge faced by the team was transforming London back to the 1900's, particularly for the famous Mary Poppins rooftop scenes. This was resolved in VFX, where more modern buildings in the footage were physically 'rubbed out'. A variety of sessions took place across the two day event, covering a range of media topics. A talk on Location Managers outlined the specific roles and requirements of the job, whilst a presentation on FAANGS- Facebook, Apple, Amazon, Netflix and Google analysed the impact of these platforms on the industry and on viewing habits. A discussion on short form content explored the increasing use and effects of social media as a way to showcase work, and a keynote on games discussed the changing perception of gaming content, technology and audience demographic.